The morning after a handful of N.F.L. players renewed their protests against social inequality and police brutality by raising fists or kneeling during the playing of the national anthem, President Trump renewed his criticism of their actions. The N.F.L.’s 2018 preseason began in earnest on Thursday with the first full slate of games, and the question that has dogged the league all summer — will players continue social justice protests during the playing of the national anthem — was answered loud and clear. 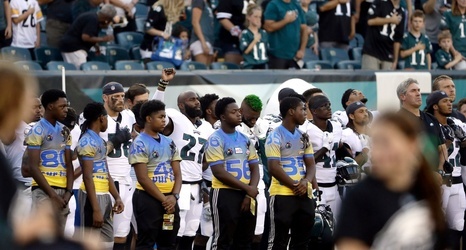 Malcolm Jenkins of the Philadelphia Eagles, one of the most outspoken players in recent years, was joined by his teammate, De’Vante Bausby, in raising a fist while the anthem was played.